There was a time when selling a home with a pet was a major issue for sellers and real estate agents. Great efforts went into masking odors, eliminating stains, putting up food/water bowls, closing doggy doors, removing litter pans, putting toys away and even finding a place for the pet to be during showings. Needless to say, it required a lot of extra work on top of the other tasks needed to get the home ready for showing. In today’s market, most of this has changed, and pet-friendly homes are now considered by many to be a benefit. With 65 percent of households currently owning a pet, having a pet is no longer a “downside” when it comes to buyers and sellers. However, even though 79 million households have at least one pet, home owners still need to present a clean, pet-stain and odor-free home when listing it for sale. More than just having pets, an estimated 83 percent of people actually consider the pet a member of the family. This is causing home owners and agents to see pet-friendly homes in a different light. Agents understand that people are passionate about their pets. But more than understanding that passion is delivering service that meets the client’s specific needs. Agents can attract more pet-friendly clients by marketing themselves as pet-savvy. To do so, agents should invest in some general education about pets and their needs. This will allow them to spot key features of a home that would attract a person with a pet. Agents can connect with pet professionals and businesses in their area to market their services. Great places to start include training schools, rescue organizations, pet stores and boarding facilities. Agents can join special groups and networks such as the Pet Realty Network which connects buyers and sellers with pet-savvy real estate agents. Agents can also connect with other agents for referrals. During the initial meeting with a buyer, agents should get information about the buyer’s pets. A separate questionnaire just for the pet needs might be beneficial. This allows the agent to see exactly what features they should look for to help make the home not only perfect for their client, but for the client’s pets as well. For example, a buyer with two big dogs will likely appreciate a larger fenced yard over an amenity that offers little by the way of quality of life for the dogs. If the buyer is looking for a home in an HOA-regulated community, agents should inform their clients about potential restrictions placed on pet ownership. For example, there could be a limit on the size or type of pet allowed. Because pet ownership is so common, it makes for a natural selling point when showcasing a pet-friendly home. Aspects such as secure fencing, convenient access to the yard, easy-to-clean floors and even a pet-friendly town can all be considered added value to a home. • Nobody loves your pet as much as you do. For the safety and wellbeing of everyone, including your pet, it is best if your pet is either put up safely, or is away from the home during a showing. • Clean up toys, bones, beds, and all other pet-related items. • Thoroughly clean all floors and carpets of dirt and stains. • Eliminate litter boxes until the showing is over. • Make sure the yard is picked up. An agent who can address the specific needs of a client with a pet is extremely valuable. Spring cleaning is the perfect opportunity for home owners to de-clutter and organize their home. It is an especially important task for home owners who currently have their home listed or plan to list in the near future. Taking the time to spruce up the home can help increase value and make a good impression on potential buyers. Here are a few simple projects that can have a big impact on a home. Real estate agents can share these tips with clients to help them prepare their home for sale. To download this graphic click here. 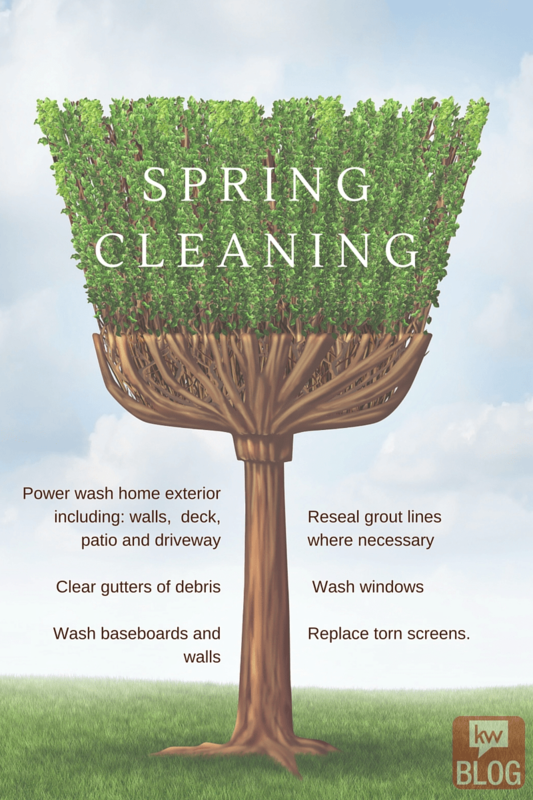 By taking the time to deep clean and reorganize this spring, home owners can increase their resale value over the short term. It is important to note that not all spring cleaning projects are created equal. Some projects may have a nice temporary appearance, but they don’t hold up in the long run. When time is an issue, the priority should be cleaning overgrown landscaping, painting the interior and exterior, cleaning all baseboards and clearing gutters of debris which causes pest and paint problems when left untreated. Time permitting, power wash patios and decks to remove mold and dirt to make the area appear clean and newer. And, don’t forget the attic. As buyers are not house guests, expect them to look in closets and attics. Take time to really organize and clean. A few small changes to these two rooms creates a big impact! According to today’s buyers, the kitchen and the master bathroom are most critiqued rooms in a home. What does this mean for sellers? They should look to improve these two influential rooms first. Whether undertaking a major remodel or making small improvements, these are the two most lived in rooms in the home and they draw the most attention. During a tour, most buyers will notice and appreciate a new vanity or countertops more than new gutters. They also notice and appreciate fresh paint and carpets. But it can be overwhelming for homeowners to consider all the potential upgrades when preparing a home for sale. However, there are two rooms that should not be ignored. If sellers are tight on budget and time, they should turn their focus to these two rooms first. 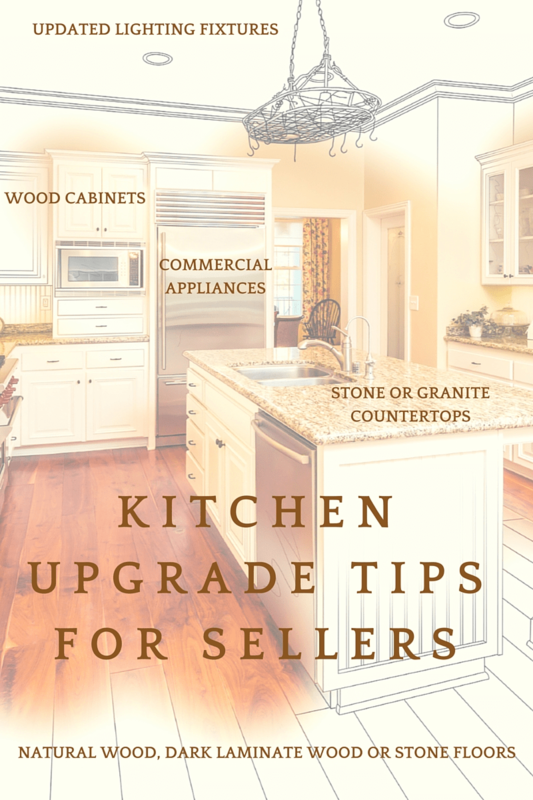 While the kitchen and master bathroom are the most expensive areas of the home in terms of remodeling, there are some budget-friendly ways to make improvements buyers will notice. Kitchens are the heart of a home and so sellers should pay attention to detail when planning improvements. 1. Install all real wood cabinets. Buyers are rarely impressed with flimsy shelves and composite materials. If attaching hardware, keep it neutral in style. 2. Buy commercial appliances, or go for the look of commercial. Upscale cooktops and ranges create real impact in the kitchen. 3. Seek to use natural wood, dark laminate wood or stone floors that clean easily. Spills can happen anywhere, but they are very common in the kitchen. Avoid light floor colors and grout as they show dirt and stains easier. 4. Install stone or granite countertops. Tile countertops are difficult to keep clean for the same reason tile floors are – the grout stains easily. Single material countertops, which are clean and easy to wipe down, are a favorite of most home chefs. They look beautiful too. 5. Update the lighting fixtures. Sellers will be amazed at the return they get from simply upgrading the kitchen lighting. Whenever remodeling to sell, keep in mind style varies, so keep items as neutral as possible. Bonus Tip: When showing the home, declutter and organize the kitchen counters. Hide the coffee maker and toaster. Remove all clutter and magnets from the fridge. You’ll be surprised at how much larger your kitchen looks without the clutter. Sellers don’t have to do a lot to make a big improvement in the master bathroom. A new tub liner, or “shell,” can make a marred tub look like new and save the seller from having to replace it. 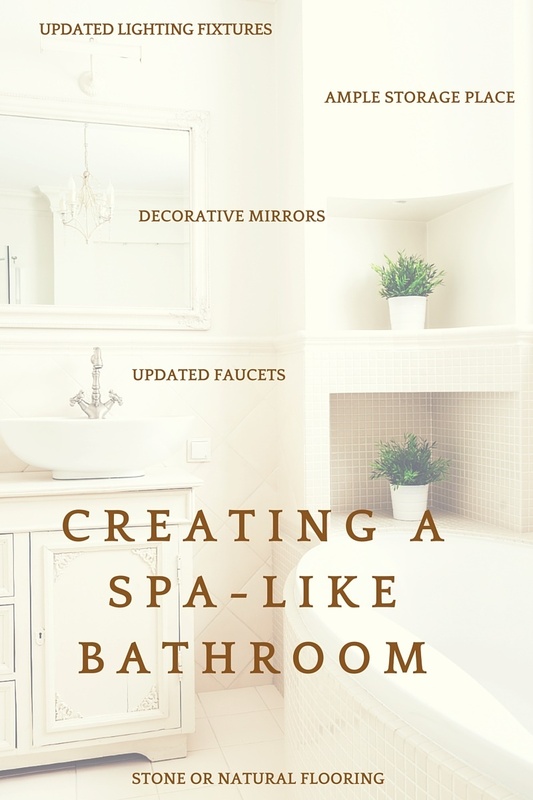 If not replacing the vanity, a new faucet, new lights, fresh caulking around the tub, a new towel rack and a new mirror can make a tired bathroom come alive. Bonus Tip: For bathrooms, always display a sparkling clean bathtub and commode. There should be no dirty clothes or even hampers visible. The bathroom should be clean and smell fresh. A kitchen or bath upgrade can be as simple as a weekend-long, low-budget brush-up. With the right planning, some of the most noticeable repairs do not require much. A fresh facelift will go a long way in the buyer’s mind. And, as for the other areas of the house, don’t skip a fresh coat of paint and replace the carpets. These details add value and make the home more attractive to buyers. Do you want to provide staging expertise for your clients? Read about how a Chicago area Keller Williams team has staged its way to multi-million dollar success.